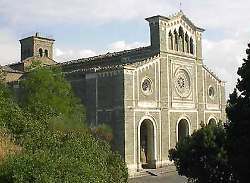 The church of Santa Margherita, which occupies a magnificent position in the upper part of Cortona, is constructed over an oratorio built originally by order of this Franciscan penitent nun and dedicated to St Basil, St Aegidius and St Catherine of Alexandria. 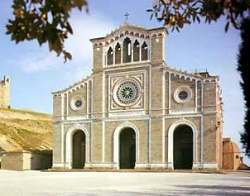 The oratorio built by order of St Margherita was in turn erected over the remains of a small church built in the 11th century by the Camaldolensian monks and dedicated only to St Basil. After St Margherita’s death in 1297, the inhabitants of Cortona ordered a larger church in her honour to be built alongside the original church dedicated to St Basilio, behind which the saint had spent the last years of her life in isolation in a small room. This larger church was designed by Giovanni Pisano and decorated with frescoes of the Senese School. In 1330 the remains of the saint were moved here, from their original resting place in San Basilio. The church we see today is the result of numerous alterations carried out through the centuries, the most recent of which took place between 1858 and 1897. Of the original architectural structure only the large rose window of the façade remains, along with the 17th century bell tower and the exterior walls of the choir. Two marble statues of the Madonna and the remains of some frescoes attributed to Lorenzetti are now in the Museo Diocesano. The body of St Margherita is visible under the high altar, within a solid silver urn designed by Pietro Berrettini in the 17th century. Above the altar on the right hangs the dramatic 13th century Crucifix that is said to have spoken to the saint. The marble sarcophagus placed against the left hand wall of the church is surmounted by a finely carved statue of the saint in a sleeping position, believed initially to have been by Giovanni Pisano but subsequently proven to have been completed in 1362 by Angiolo and Francesco di Pietro, two sculptors who were born in Cortona but who lived in Assisi. The square in front of the church enjoys a spectacular view of the Val di Chiana, towards Monte Amiata, Cetona and Lake Trasimene.